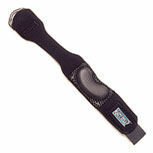 Hely Weber Matt Strap is the foremost elbow band in many practices for bicipital tendonitis and tennis elbow. This tennis elbow band features a unique buttress using Spectron rubber to create a tackiness that helps keep the buttress stable on the forearm. Originally designed to treat patellar tendonitis, the Matt-Strap is constructed of universal pressure-sensitive neoprene combined with a unique foamed silicone buttress and covered with non-slip Spectron material. As tension is applied to the tendon during activity, the shock absorbing foamed silicone buttress effectively diffuses energy and reduces the tensile load that reaches the tendon insertion point. Universal Matt Strap has the same non-slip spectron buttress as the sized Matt Stap models for effective compression without slippage or rotation while on the arm or knee. The user can achieve a more custom fit with the universal Matt Strap product model verses the sized Matt Strap offerings.